The 2018 Boston Red Sox season was the 118th season in the team's history, and their 107th season at Fenway Park. Under first year manager Alex Cora, the team finished with a 108–54 record, winning the American League East division title for the third consecutive season, and finished eight games ahead of the second-place New York Yankees. The Red Sox were the first MLB team to post 100 wins during the 2018 season, reaching that milestone for the first time since 1946; they were also the first team to clinch a berth in the 2018 postseason. The team set a new franchise record for wins in a season by surpassing the prior mark of 105 that had been set in 1912; they also won the most games by any MLB team since the 2001 Seattle Mariners won 116. The Red Sox entered the postseason as the top seed in the American League, and defeated the Yankees in four games in the Division Series. They then defeated the defending champion Houston Astros in five games in the Championship Series, advancing to the World Series where they defeated the Los Angeles Dodgers in five games. On October 11, the Red Sox announced that John Farrell would not return as the team's manager for the 2018 season. 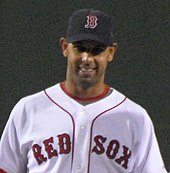 On October 22, the Red Sox announced that Alex Cora, who spent 2005–2008 with the club, had signed a three-year deal to become the new manager of the team. On October 25, it was reported that the Red Sox received approval from the Boston Landmarks Commission to add premium seating next to both dugouts. The seats, later branded the Jim Beam Dugout, became available for the 2018 season, at per-game prices starting at $12,500 for 25 guests. On October 26, the Cleveland Indians hired pitching coach Carl Willis and the Chicago Cubs hired hitting coach Chili Davis and third base coach Brian Butterfield. On November 2, the Red Sox named Carlos Febles as their third base coach; Febles has been in the Red Sox organization since 2007, and most recently was manager of the Portland Sea Dogs. The same day, the Red Sox named Ron Roenicke as bench coach; he previously managed the Milwaukee Brewers (2011–2015) and most recently was third base coach of the Los Angeles Angels. On November 4, Tim Hyers was named hitting coach of the Red Sox; he was previously with the team from 2013 through 2015 as minor league hitting coordinator, then spent 2016 and 2017 as assistant hitting coach for the Los Angeles Dodgers. On November 8, the Red Sox named Dana LeVangie as their pitching coach; LeVangie has been with the Red Sox since 1991; he was a minor league player (1991–1996), bullpen catcher (1997–2004), and a scout (2005–2012) before joining the coaching staff. On November 13, the Red Sox hired Craig Bjornson as their bullpen coach; Bjornson had been in the same role with the Houston Astros for the 2014 though 2017 seasons. On December 18, the Red Sox re-signed first baseman Mitch Moreland to a two-year, $13M contract. On January 22, it was reported that the safety netting at Fenway Park would be extended down both foul lines; to Section 79 in left field and to Section 9 in right field. On February 5—"Truck Day"—equipment for spring training left Fenway Park for jetBlue Park at Fenway South. On February 14, pitchers and catchers had their first workout at spring training. On February 18, the Red Sox re-signed IF Eduardo Núñez to a one-year, $4M deal. On February 19, the team had its first full squad workout at spring training. On February 22, the team played exhibition games against the Northeastern Huskies and the Boston College Eagles; the Red Sox won both games, by scores of 15–2 and 4–2, respectively. On February 23, the team played its first Grapefruit League game, against the Minnesota Twins; the Red Sox won, 4–3. On February 26, the Red Sox announced they signed OF/DH J. D. Martinez to a five-year, $110M deal. On February 28, the Red Sox announced that they had filed a petition with the City of Boston to change the name of Yawkey Way—the street where the main entrance of Fenway Park is located—to its original name, Jersey Street. The change was approved in April 2018, and the name reverted in May 2018. 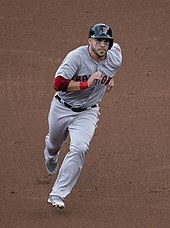 On March 24, the Red Sox traded IF Deven Marrero to the Arizona Diamondbacks for a player to be named later or cash considerations. On March 27, the team played its final spring training game, defeating the Chicago Cubs, 4–2. The 2018 regular season began on March 29, 2018, against the Tampa Bay Rays at Tropicana Field. Manager Alex Cora named Chris Sale as the Red Sox opening day starter opposite Chris Archer. The Red Sox built a 4–0 lead through seven innings, including an inside-the-park home run by Eduardo Núñez. Sale pitched six innings, giving up just one hit and walking three, while striking out nine. After Matt Barnes held the Rays scoreless in the seventh inning, Joe Kelly and Carson Smith gave up a total of six runs in the eighth inning, allowing Tampa Bay to take a 6–4 lead. Rays closer Álex Colomé pitched a scoreless ninth inning for the save. After the tough loss on opening day, David Price made his 2018 debut and threw seven shut-out innings on just 76 pitches. Matt Barnes and Craig Kimbrel shut the door. The lone run of the game was scored by Xander Bogaerts in the seventh. In game three of the four-game series, the baseball was handed to Rick Porcello, who pitched ​5 1⁄3 innings and allowed one run on six hits. Bogaerts went 3-for-4, scored a run, drove in two, and hit his fifth double of the season. For the third game in a row, the Red Sox won the match by the smallest of margins. Héctor Velázquez allowed one run in ​5 2⁄3 innings. Mookie Betts and Jackie Bradley Jr. scored to win the series. In the series opener, Brian Johnson made his season debut and continued the strong start of Boston's starting pitching. He allowed only one run in six innings, while Hanley Ramírez and Mookie Betts went yard for the first time of the young season. Final score, 7–3 for Boston. The next day, Chris Sale exited the game after five innings with the score tied 1–1, followed by five scoreless frames. The Red Sox scored in the top of the 11th, but the Marlins got a tying run off of Matt Barnes in the bottom of the 11th. Ramírez then drove in Betts and Andrew Benintendi in the top of the 13th, with Heath Hembree picking up the win, 4–2. In the first game of the series, David Price pitched seven innings, giving up no runs on three hits, but the Red Sox had to force extra innings with two runs in the bottom of the ninth. After two scoreless extra frames, Hanley Ramírez hit a bases-loaded single in the bottom of the 12th to give Boston the win, 3–2. After a rare scheduled Friday off-day, Boston jumped out to an 8–2 lead after two innings of the series' second game, en route to a 10–3 victory. In the series' finale on Sunday, Tampa Bay held a 7–2 lead with two outs in the bottom of the eighth; Boston then had six consecutive hits (three singles and three doubles) to take the lead, 8–7. Craig Kimbrel pitched a one-two-three ninth, to give the Red Sox the sweep. The Red Sox jumped out to an early lead, then added a nine-run sixth inning, to take the first game of the series, 14–1. The first third of the Boston batting order was a combined 8-for-10 with eight runs and nine RBIs. Boston's winning streak then ended at nine games in a 10–7 loss to Masahiro Tanaka on April 11. The game included an incident where Red Sox relief pitcher Joe Kelly hit Yankees' designated hitter Tyler Austin with a pitch, following an allegedly dirty slide by Austin in which he spiked fielder Brock Holt. Austin charged Kelly and started a bench-clearing brawl; four players, including Kelly and Austin, were ejected. Boston subsequently won the final game of the series, 6–3, with Rick Porcello allowing only two hits in seven shutout innings. Craig Kimbrel had seven saves through the end of April. The Red Sox jumped out to a 4–1 lead in the first inning of the opening game of the series. Eduardo Rodríguez held the Orioles to one run in six innings, en route to a 7–3 win. Boston again took an early lead in the second game; 3–0 at the end of the first, and 8–0 at the end of the fourth. Héctor Velázquez got the win in the 10–3 victory. The third game of the series was tied 1–1 through five innings, with Boston getting the go-ahead run in the sixth on an error and wild pitch, and then an insurance run on a Tzu-Wei Lin ground rule double. Heath Hembree got the win in relief; final score 3–1. The final game of the series—set for Patriots' Day—was rained out and rescheduled for May 17. In the first game of the series, the Red Sox got three early runs off of Shohei Ohtani, who only lasted two innings. Boston added five more in the third, en route to a 10–1 win; Mookie Betts had three home runs. Boston again jumped out to an early lead in the second game; up 6–0 after three, starter Rick Porcello and the bullpen held Los Angeles scoreless, for a 9–0 victory. The final game of the series found Boston up a run, 3–2, at the end of five. The Red Sox then outscored the Angels 5–0 during the final four innings, for an 8–2 win to complete the sweep. After a come-from-behind victory in the first game of the series, which extended Boston's winning streak to eight games, the Red Sox were no-hit by Sean Manaea on April 21. Entering the game with a 17–2 record, the Red Sox had the best winning percentage (.895) of any MLB team ever no-hit. It was the first no-hitter against the Red Sox since Chris Bosio of the Seattle Mariners on April 22, 1993. Boston also lost the third and final game of the series; it was the first time the team had consecutive losses during the season. In the first game of the series, the Red Sox rallied from a 3–1 deficit in the top of the ninth, and the game went to extra innings. In the bottom of the 10th inning, Curtis Granderson hit a one-out solo home run off of Craig Kimbrel to give the Blue Jays a 4–3 win, extending Boston's losing streak to three games. The Red Sox were able to win the final two games of the series, each by a single run with Kimbrel getting both saves, giving them six wins from their nine-game road trip. After falling behind 4–0 in the first game of the series, the Red Sox rallied but came up a run short, losing 4–3 to the Rays. In the second game of the series, after playing to a 5–5 tie through five innings, the Red Sox gave up seven runs in the final four innings, losing 12–6, their fifth loss in seven games. Boston then won the final game of the series, 4–3. After giving up three first-inning runs, the Red Sox rallied to a 10–6 win in the opening game of the series. Four runs came on a Xander Bogaerts grand slam, making the 2018 Red Sox only the second team in MLB history, along with the 1996 Montreal Expos, to have six grand slams by May 1. The 19 wins the Red Sox had in April set a new club record; the prior mark was 18, most recently accomplished by the 2013 team. A blown save by Craig Kimbrel, in giving up a ninth-inning home run to Alex Gordon, sent the second game of the series into extra innings. With the Red Sox down a run in the bottom of the 12th, a home run by Eduardo Núñez tied the game, 4–4. A three-run home run by Jorge Soler in the top of the 13th put the Royals up 7–4, and a Red Sox rally in the bottom of the inning came up a run short, the Royals winning 7–6. The Royals took an early 3–0 lead in the rubber match of the series but the Red Sox tied the game in the fourth with Mookie Betts and J. D. Martinez going yard. Betts then single-handedly won the game for Boston, by taking Danny Duffy deep two more times. 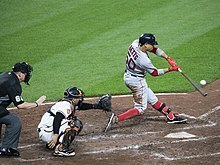 This was Betts' fourth three-homer game of his young career, making him the Red Sox' franchise leader for such games, surpassing Ted Williams. In the series opener, David Price lasted only ​3 2⁄3 innings while giving up nine runs (seven earned) as the Red Sox lost to the Rangers, 11–5. Mookie Betts followed up his three-homer game with a 2-for-4 effort at the plate, including his 12th home run of the season. In the second game of the series, Rick Porcello held the Rangers to three hits and one run in six innings, as the Red Sox won, 5–1. The Red Sox had four home runs; Betts (his fifth in three games), J. D. Martinez, and two by Rafael Devers. After falling behind 4–1 in the third game of the series, the Red Sox came back to win, 6–5, with Craig Kimbrel getting the save, the 300th of his MLB career. In the fourth and final game of the series, Chris Sale held the Rangers to four hits and one run in seven innings of work, en route to a 6–1 Red Sox victory. In the opening game of the series, Boston outhit New York, 8–6, but the Yankees had two solo home runs from Giancarlo Stanton en route to a 3–2 win. It was the Yankees' ninth win in their last ten games, putting them into a tie with the Red Sox atop the AL East, with identical 25–10 records. In the second game of the series, after trailing 4–2 at the end of the third, the Red Sox held a 6–5 lead going into the bottom of the eighth. With runners on first and second with one out, Craig Kimbrel was brought in, for a potential five-out save. A triple by Brett Gardner, followed by an Aaron Judge two-run homer, put the Yankees ahead, 9–6. Aroldis Chapman pitched a scoreless ninth to give the Yankees the win, and first place in the AL East standings. In the final game of the series, the Red Sox held a 4–0 lead going into the bottom of the seventh, with Hanley Ramírez having contributed three RBIs. The Yankees loaded the bases with one out off of Heath Hembree, and were able to push across four runs to tie the game after Joe Kelly came in. The Red Sox re-took the lead in the top of the eighth, on a J. D. Martinez solo home run. Kelly then held the Yankees scoreless in the bottom of the eighth, and Craig Kimbrel pitched a one-two-three ninth, earning his tenth save of the season. The win put the Red Sox back into a tie with the Yankees for first place in the AL East, both teams at 26–11. 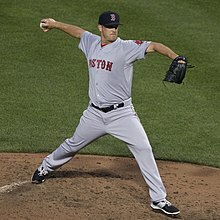 In the first game of the series, Chris Sale became the third Boston pitcher, after Roger Clemens and Pedro Martínez, to have a game with 15 strikeouts while issuing no walks. Sale pitched nine innings of a game that would go 12 innings, with Toronto winning 5–3 on a two-run walk-off home run by Luke Maile off of Brian Johnson. In the second game of the series, David Price pitched ​5 1⁄3 innings, giving up two runs and getting the win, after his scheduled start against the Yankees had been pushed back due to numbness in his throwing hand, which was subsequently diagnosed as a mild case of carpal tunnel syndrome. Hanley Ramírez had a two-run homer en route to a 5–2 Boston win. In the final game of the series, a first-inning two-run home run from J. D. Martinez put Boston ahead early. After starter Drew Pomeranz left with no outs in the fifth inning, the Red Sox bullpen allowed one inherited runner to score, and then held Toronto to no further runs through the end of the game. Joe Kelly picking up his second save of the season, in a Boston 5–3 victory. The opening game of the series included five solo home runs; three by Oakland and two by Boston. The Red Sox trailed from the fourth inning on, ultimately losing 6–5. Rain delayed the start of the second game of the series by almost two hours. Oakland jumped out to a 2–0 lead in the first inning, and Boston closed the gap to 3–2 after five innings. The Athletics added two runs in the eighth, and although the Red Sox got one run in the ninth, closer Blake Treinen converted his second save in two days as the Athletics won, 5–3. In the third game of the series, Chris Sale handed over a 3–2 lead to the bullpen after five innings, due to a high pitch count (102). Boston again outscored Oakland 3–2 in the final four innings, for a 6–4 final. Mookie Betts hit his 15th home run of the season against Baltimore on May 19. David Price threw a 95-pitch complete game in the first game of the series, as the Red Sox won, 6–2. Baltimore's only runs came on a Manny Machado two-run homer with two outs in the ninth. With the win, the Red Sox became the first MLB team to reach 30 wins in the 2018 season. The second game of the series was tied at one in the top of the fourth with two outs, when Baltimore scored four runs off of Boston starter Drew Pomeranz. Despite a 3-for-5 effort from Mookie Betts, including his 14th home run of the season, the Red Sox could not make up the deficit; final score 7–4 for the Orioles. In the third game of the series, the Red Sox broke a 1–1 tie with three runs in the fifth inning, on back-to-back home runs from Betts (with Sandy León on base) and Andrew Benintendi. Craig Kimbrel earned his 13th save of the season in closing out the 6–3 victory. In the final game of the series, a pair of J. D. Martinez home runs helped lead Boston to a 5–0 win; the Orioles outhit the Red Sox, 13–12, but were unable to score as they had 14 men left on base. In the first game of the series, Chris Sale pitched ​7 2⁄3 innings while holding the Rays to two runs (one earned) while striking out nine and walking two. Mookie Betts and Rafael Devers both homered as the Red Sox won, 4–2. The second game of the series was tied 1–1 entering the ninth, when Boston pushed across three runs, aided by an error, walk, and passed ball by Tampa Bay. Closer Craig Kimbrel then retired the Rays in order for his 15th save of the season. Tampa Bay took the final game of the series, 6–3, as Rick Porcello gave up six runs (four earned) in ​3 2⁄3 innings, requiring 92 pitches. The series' first game was a 6–2 win for the Red Sox, powered by home runs from J. D. Martinez, Xander Bogaerts, Mookie Betts, and Mitch Moreland. Dustin Pedroia was on the active roster for the first time of the season, but did not play in the game. Earlier in the day, in order to open up a roster spot for Pedroia, the team announced that Hanley Ramírez had been designated for assignment. In the second game of the series, neither starting pitcher lasted four innings, and the two teams used a total of nine relief pitchers. Steven Wright was the most effective, pitching three innings of scoreless relief and picking up the win, as the Red Sox rallied from deficits of 3–0 and 5–3 to win, 8–6. Chris Sale had eight strikeouts in ​4 1⁄3 innings of the final game of the series, but was roughed up for six runs by Atlanta, as Boston lost 7–1. In the first game of the series, the Red Sox sent eight men to the plate in the bottom of the fourth, pushing across five runs on the way to an 8–3 victory. David Price gave up four hits and two runs over five innings, picking up the win as the bullpen allowed just one run through the final four innings. Andrew Benintendi had a 3-for-5 day with four RBIs, missing just a double to complete the cycle. The second game of the series also yielded an 8–3 Boston win, as the Red Sox scored in six of the eight innings they batted, including home runs from Benintendi and Sandy León. Rick Porcello improved his record to 7–2, and Craig Kimbrel notched his 17th save. Boston completed the sweep with a 6–4 win in the final game of the series. Toronto tied the game at two in the top of the sixth, and later rallied for two runs in the top of the ninth, before coming up short. J. D. Martinez hit his 18th home run of the 2018 season, putting him into a tie with Mike Trout of the Los Angeles Angels for the MLB lead in that category. The Astros scored two first-innings runs on a Carlos Correa home run off of Drew Pomeranz en route to a 4–2 win in the first game of the series. Rick Porcello's win on June 3 pushed his record to 8–2. In the second game of the series, Houston had home runs from George Springer, Carlos Correa, and Evan Gattis in their 7–3 win over Boston. J. D. Martinez had his 19th home run of the season, while Mookie Betts was placed on the 10-day disabled list. Trailing by a run entering the seventh inning of the third game of the series, the Red Sox rallied for three runs in the frame on the way to a 5–4 win. A two-run Andrew Benintendi homer provided the winning edge, while Dustin Pedroia was placed on the 10-day disabled list after appearing in only three games since making his season debut on May 26. In the closing game of the series, the Red Sox had 15 hits while Rick Porcello picked up his eighth win of the season in a 9–3 Boston victory. Brock Holt had three RBIs while Benintendi and Mitch Moreland both homered. In the first game of the series, Steven Wright made a spot start, and pitched seven shutout innings to get the win. Xander Bogaerts and J. D. Martinez both had home runs in support of the 6–0 Boston victory; meanwhile, Drew Pomeranz was placed on the disabled list. Boston won the second game of the series, 7–1, as Andrew Benintendi and Christian Vázquez each had home runs; Vázquez went 3-for-4 with two RBIs and two runs scored. Jalen Beeks made his MLB debut as Red Sox starter in the third game of the series, yielding five first-inning runs to the Tigers, who went on to win, 7–2. Benintendi homered again for Boston, his 11th of the season. Chris Sale pitched eight innings while striking out ten and allowing just one run in the opening game of the series, but the Red Sox were unable to score and fell to the White Sox, 1–0. In the middle game of the series, home runs from Jackie Bradley Jr. and J. D. Martinez led Boston to a 4–2 win, with David Price improving his record to 7–4. In the closing game, the White Sox held the Red Sox' offense in check, winning 5–2 and giving Chicago the series. Steven Wright shutout the Orioles for ​6 2⁄3 innings, but neither team could score and the first game of the series went to extra innings. In the 12th inning, the Red Sox pushed across two runs on sacrifice flies, with Craig Kimbrel then closing out the win for his 21st save of the season. Mookie Betts returned from the disabled list, batted leadoff, and went 1-for-5. In the second game of the series, Eduardo Rodríguez improved his record to 8–1 with the win. Boston's 6–4 victory included home runs from Rafael Devers and Andrew Benintendi. The two teams combined for 20 hits and 16 walks in a game that took nearly four hours to complete. The Red Sox completed the sweep with a 5–1 win in the third game of the series; Chris Sale was the winning pitcher while Betts and J. D. Martinez both homered. Eduardo Rodríguez's record stood at 9–1 after his win on June 17. In the series' opening game, starters David Price and Félix Hernández both went seven innings, with the Red Sox holding a 2–1 lead thanks to a sixth-inning home run by Xander Bogaerts. Neither bullpen allowed a run, with Red Sox closer Craig Kimbrel issuing two walks but getting his 22nd save of the season. In the second game of the series, Rick Porcello pitched six innings and left with the Red Sox ahead, 6–4. However, Seattle scored three runs off of the Boston bullpen, for a 7–6 win. All the Red Sox' runs came in the third inning, when they sent 11 men to the plate. Steven Wright, starter of the third game of the series, held Seattle to one run through seven innings, but Boston was limited to two hits and unable to score, as the Red Sox fell 1–0 to the Mariners. In the final game of the series, Boston jumped out to a 5–0 lead in the third inning and never looked back, winning 9–3. Eduardo Rodríguez notched his ninth win of the season, while Bogaerts, Jackie Bradley Jr., and Rafael Devers each homered. The first game of the series was tied 2–2 going to the bottom of the eighth inning; the Twins then scored four runs—two each off of Robby Scott and Joe Kelly—as the Red Sox fell, 6–2. In the second game of the series, the Red Sox were held to one run on four hits, while the Twins were powered by home runs from Robbie Grossman and Max Kepler, defeating Boston, 4–1. After being held to three runs in the first two games of the series, the Red Sox offense produced 16 hits and won the final game, 9–2. Rick Porcello improved his record to 9–3, while Mookie Betts and Andrew Benintendi both homered. The opening game of the series saw nine runs scored in the first inning, and Seattle led 10–5 entering the fifth inning. Boston outscored Seattle 9–0 the rest of the way, for a 14–10 win. Red Sox starter Steven Wright gave up ten earned runs—raising his season ERA from 1.23 to 3.38—but escaped with a no decision. Nelson Cruz of the Mariners had two home runs and seven RBIs in a losing effort. For the Red Sox, J. D. Martinez went 4-for-5 with a home run and five RBIs, and every batter had at least one hit. In the second game of the series, Seattle again jumped out to an early lead, 5–0 after four innings. This time, there would be no Boston comeback, as it was 7–0 going to the ninth, with the Red Sox only scoring two late runs. Eduardo Rodríguez took the loss, his first since May 15, and only his second of the season. In the closing game of the series, Chris Sale had 13 strikeouts while holding Seattle scoreless through seven innings. The Red Sox bullpen completed the shutout, while Mitch Moreland homered in support of the 5–0 win. Rafael Devers was 5-for-5, including a grand slam, on June 30. In the series' first game, Boston had a 5–0 lead after two innings and went on to win, 9–1. David Price improved his record to 9–5, while Mookie Betts, Jackie Bradley Jr., Christian Vázquez, and J. D. Martinez each homered. In the second game of the series, the Red Sox jumped out to a 6–0 lead in the second inning. The Angels fought back to tie it, 6–6, in the seventh, with Boston then scoring three unanswered runs for a 9–6 victory. The two teams used a combined 12 pitchers, with Angels reliever Jake Jewell leaving the game after an apparent ankle injury suffered while trying to make a play at the plate. The Red Sox had home runs from Martinez, Sandy León, and Eduardo Núñez. In the series' final game, Brian Johnson started and left after four innings with the Red Sox trailing, 1–0. 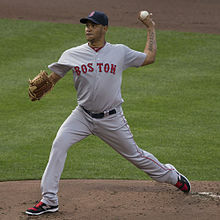 Héctor Velázquez then pitched two scoreless innings as Boston took the lead, 2–1, and was credited with the win as the Red Sox stayed ahead for a 4–2 final. Craig Kimbrel got his second consecutive save, bringing his season total to 24. Bradley Jr. and Rafael Devers both homered, as Boston completed the sweep. For the first time in franchise history, the Red Sox swept a season series of 5 or more games and also set a major league record of 20 home run against a single opponent with 6 or fewer games played against in a season. In the first game of the series, New York built a 5–0 lead after four innings, en route to an 8–1 win. Boston starter Eduardo Rodríguez gave up five runs in six innings, taking the loss. The Yankees had four home runs, including two by Greg Bird, while new Red Sox 1B/OF Steve Pearce was 2-for-4 in his debut game with the team. In the middle game of the series, a first-inning grand slam from Rafael Devers put Boston up early, in a game they would go on to win, 11–0. Devers was 5-for-5 at the plate, lacking only a triple for the cycle. Sandy León also homered for the Red Sox, while Chris Sale improved his record to 8–4. In the third and final game of the series, the Yankees jumped on David Price early, scoring six first-inning runs. Price went ​3 1⁄3 innings, allowing five homers and eight runs. The Yankees had six home runs, including three from Aaron Hicks, as they defeated Boston, 11–1. In the opening game of the series, Rick Porcello drove in three runs with a bases-loaded double in the second inning; he pitched six innings, limiting the Nationals to two runs on seven hits, and got the win, his tenth of the season. Boston's other run in the 4–3 final came on a Mookie Betts home run, with Craig Kimbrel notching his 25th save of the season. In the second game of the series, the Red Sox had a pair of three-run home runs from Eduardo Núñez and Xander Bogaerts, plus a two-run shot from J. D. Martinez, en route to an 11–4 win. On Independence Day, the third game of the series was scoreless through six innings, until Boston score twice in the seventh and once in the ninth, for a 3–0 victory to complete the sweep. Jackie Bradley Jr. had two RBIs, while Eduardo Rodríguez captured his 10th win of the season. Andrew Benintendi went 8-for-11 with seven runs scored in the July 6–8 three-game series. In the series opener, the Red Sox scored four runs in the first, and another four in the second, jumping out early in what would be a 10–5 win. Mookie Betts, J. D. Martinez, and Xander Bogaerts each homered, while Chris Sale improved his record to 9–4. Tyler Thornburg, acquired by Boston in December 2016 and out for the 2017 season due to surgery, made his Red Sox debut. The second game of the series was tied at four after five innings; the Red Sox then outscored the Royals 11–0, with Royals catcher Drew Butera facing six batters to record the final Boston out in the ninth, for a 15–4 final. Andrew Benintendi had a home run and a double, going 2-for-2 along with four walks, batting behind Betts who went 4-for-6. David Price had a no decision, leaving after ​4 2⁄3 innings, with Heath Hembree picking up the win after pitching ​1 1⁄3 hitless innings in relief. In the final game of the series, Rick Porcello allowed nine hits in seven innings, but held the Royals to three runs and got the win, improving his season record to 11–3. Boston's three-run seventh inning was the difference in the 7–4 final score. Benintendi was 4-for-5 at the plate, while Craig Kimbrel recorded his 27th save of the year. The Red Sox' winning streak was extended to seven games with a 5–0 victory in the opening game of the series. Boston's runs came on a Steve Pearce two-run homer in the first, and a J. D. Martinez three-run homer in the eighth. Eduardo Rodríguez improved his record to 11–3 for the season. In the middle game of the series, the Red Sox sent nine men to the plate in a five-run third inning, and won again, 8–4. Boston used six pitchers in the game, with reliever Matt Barnes getting the win; Héctor Velázquez, making a spot start, left after three innings. A 4–2 Boston win in the final game of the series completed the sweep, with Chris Sale improving his record to 10–4 for the season. Xander Bogaerts was 3-for-4 at the plate including a triple. Xander Bogaerts hit his third grand slam of the season on July 14. In the opener of a four-game series, Boston scored all but one of their runs in the fourth inning as they defeated Toronto, 6–4, extending their winning streak to ten games. Mookie Betts hit the team's eighth grand slam of the season, in a 13-pitch at bat—a full count plus seven pitches fouled off—as he went 2-for-4 with five RBIs. With a 66–29 record, the Red Sox reached 37 games over .500 for the first time since 1949. Boston's winning streak came to an end in the second game of the series, a 13–7 loss to Toronto. The two teams used a total of 13 pitchers, as both starters only retired a combined 15 batters. Betts was 3-for-4 at the plate—raising his average to .357 for the season—along with a walk, two RBIs, and two runs scored. The third game of the series went to extra innings, after Boston scored the tying run in the bottom of the ninth on back-to-back doubles by Xander Bogaerts and Jackie Bradley Jr. In the bottom of the tenth, the Red Sox loaded the bases on an error, a single, and an intentional walk. Bogaerts then hit a walk-off grand slam to win the game, 6–2. It was Bogaerts' third grand slam of the season and the Red Sox' ninth. Boston won the final game of series, 5–2, with Bogaerts again homering and Craig Kimbrel getting his 30th save of the season. The Red Sox reached the All-Star break with MLB's best record (68–30, a .694 winning percentage) and a ​4 1⁄2 game lead over the Yankees in the AL East. In an 8–6 American League win in 10 innings, four of the five Red Sox all-stars played in the game. Mookie Betts started in right field and was 0-for-3 at the plate, while J. D. Martinez started at DH and was 1-for-2. Chris Sale was the AL starting pitcher, striking out one and allowing one hit in an inning of work. Mitch Moreland was 2-for-3 after entering the game at first base. Closer Craig Kimbrel did not play. The one and only run in the first game of the series came in the top of the first inning, when Steve Pearce drove in Andrew Benintendi. It was the Red Sox' first 1–0 win since the second game of the season. David Price pitched ​6 1⁄3 scoreless innings for the win, with Craig Kimbrel getting the save. Boston fell to Detroit in the second game of the series, 5–0, despite outhitting the Tigers, 8–7. Starter Brian Johnson took the loss, although both runs he allowed in five innings of work were unearned. The Red Sox won the series' final game, 9–1, with Jackie Bradley Jr. going 2-for-4 with three RBIs, while Chris Sale improved his record to 11–4. A 5–3 win in the first game of the series gave Boston a 71–31 record, reaching 40 games over .500 for the first time since their 1949 season. Rick Porcello pitched six scoreless innings for the win, while Mitch Moreland hit his 12th home run of the season. For the second game of the series, the Red Sox activated Drew Pomeranz from the disabled list; he took the mound for the first time since May 31. Pomeranz allowed four runs in ​4 2⁄3 innings, taking the loss as Baltimore prevailed, 7–6. Trailing 7–3 after five innings, Boston scored twice in the eighth and once in the ninth to nearly force extra innings. J. D. Martinez had two home runs, increasing his total to 31 for the season; Blake Swihart and Mookie Betts had one each. The third and final game of the series was postponed, due to rain. The Red Sox had jumped out to a 5–0 lead—including home runs from Betts, Martinez, and Andrew Benintendi—in two innings of play before the game was halted; however, those statistics are discarded, as the game will be replayed from the start. Nathan Eovaldi, seen here in 2012, got the win in his Boston debut on July 29. Minnesota won the first game of the series, 2–1, with two late runs after Boston had gone out to a 1–0 lead in the second inning. The Red Sox threatened in the bottom of the ninth, loading the bases with two outs, with Twins closer Fernando Rodney striking out Jackie Bradley Jr. to complete the save. In the second game of the series, Boston took a 2–0 lead in the fifth inning via a Bradley Jr. home run. The Twins got back one run in the seventh, and then scored two runs off of closer Craig Kimbrel with two outs in the ninth, to take a 3–2 lead. Rafael Devers forced extra innings with a home run in the bottom of the ninth, and Mookie Betts opened the bottom of the tenth with a walk-off home run, giving the Red Sox a 4–3 win. Boston won the third game of the series, 10–4, with Rick Porcello improving his record to 13–4 for the year. Five Red Sox batters had two hits each, including J. D. Martinez who hit his 32nd home run of the season. Boston won the final game of the series, 3–0, with Martinez going 2-for-4 and driving in all three runs. Recently acquired starting pitcher Nathan Eovaldi made his Red Sox debut, allowing four hits in seven innings while striking out five and issuing no walks. The first game of the series was tied 1–1 at the end of five innings, with no further scoring until the bottom of the 13th, when Blake Swihart drove in Eduardo Núñez for a 2–1 victory. All of Boston's hits came from the bottom four spots in the order, which went a collective 7-for-19. Philadelphia won the second and final game of the series, 3–1. Newly acquired second baseman Ian Kinsler made his Red Sox debut and went 1-for-4. Xander Bogaerts drove in Swihart for Boston's only run. Andrew Benintendi's extra-inning RBI in the fourth game of the series completed the Red Sox' sweep of the Yankees. In the first game of the four game set, the Yankees jumped out to an early 4–0 lead, only to see Boston score the next 10 runs, including eight in the fourth inning, en route to a 15–7 final. Much of the offense came from the top third of the Red Sox order: Mookie Betts was 4-for-4 plus two walks, Andrew Benintendi was 3-for-6 with three RBIs, and Steve Pearce was 3-for-5 with six RBIs; all three of his hits were home runs. Pearce joined Kevin Millar and Mo Vaughn as the only Red Sox players to have a three-homer game against the Yankees. In the second game of the series, Rick Porcello allowed only one run and one hit in a complete game effort, improving his record to 14–4 as the Red Sox won, 4–1. Alex Cora had been ejected in the bottom of the first inning, his first ejection as Boston manager, after taking exception to warnings issued to both dugouts. Boston then scored three runs, with two coming on a Pearce homer. Ian Kinsler had to leave the game due to injury, and was later placed on the disabled list; Betts replaced him at second base for several innings, his first time playing the position since 2014. Boston won the third game of the series, 4–1, with Nathan Eovaldi allowing no runs and three hits in eight innings. Mitch Moreland and J. D. Martinez both hit home runs. The Red Sox completed the four-game sweep in a 10-inning, 5–4 win that was broadcast on Sunday Night Baseball. A Betts solo home run put Boston ahead in the fifth inning; however, New York capitalized on a Xander Bogaerts error in the seventh inning to go ahead, 4–1. With that score, Yankees closer Aroldis Chapman came on in the bottom of the ninth, but struggled, striking out two and walking three. With the bases loaded, a Martinez single cut the lead to 4–3. A Bogaerts grounder then drew an errant throw from Yankees third baseman Miguel Andújar, allowing Jackie Bradley Jr. to score the tying run. The game went to extra innings after Moreland struck out, with Matt Barnes retiring the side in order in the top of the 10th. In the bottom of the 10th, Sandy León hit a two-out single and advanced to second on a wild pitch. Betts was intentionally walked, and Tony Renda made his Red Sox debut as a pinch runner for León. Benintendi then singled to center, scoring Renda, to secure the win and complete the sweep. The first game of the series found Toronto leading, 3–1, when Boston scored four in the top of the eighth, including three on a J. D. Martinez home run, to take a 5–3 lead. Toronto then forced extra innings, with a run each in the bottom of the eighth and ninth innings. In the top of the tenth, Boston scored five runs, via homers by Mitch Moreland and Jackie Bradley Jr. Toronto could only answer with two runs, for a 10–7 final and fifth consecutive Red Sox win. In the series' second game, Boston jumped out to a 4–0 lead after three innings, ultimately winning 10–5. Rafael Devers hit a home run in his first game back from the disabled list. Boston's winning streak then ended at six games, as Toronto won the final game of the series, 8–5. Rick Porcello gave up seven runs in four innings, taking the loss. Martinez hit his 35th home run of the season, while Mookie Betts' ninth inning homer completed the cycle, the first of his career and first of the 2018 MLB season. J. D. Martinez was the first player to reach 100 RBIs in the 2018 MLB season. In a game with 33 total hits, the Red Sox out-slugged the Orioles, 19–12, in the first game of the series. Trailing 8–5 after five innings, Boston scored six runs in the sixth, three in the seventh, and five in the eighth. Drew Pomeranz, pitching out of the bullpen, got the win, while Brock Holt went 3-for-4 with three RBIs. Holt, Xander Bogaerts, and Andrew Benintendi each homered. J. D. Martinez had two RBIs, giving him 101 for the season. The second game of the series—the first game of a day-night doubleheader to make-up a July 25 rainout—was won by Boston, 5–0. David Price pitched six shutout innings, while Jackie Bradley Jr. hit two home runs and Eduardo Núñez also homered. In the second game of the doubleheader, Boston used seven pitchers en route to a 6–4 win. Martinez hit two home runs, giving him 37 for the season, while Craig Kimbrel recorded his 34th save of the year. Boston won the fourth and final game of the series, 4–1, with Chris Sale recording the win in his return from the disabled list. Steve Pearce homered, and Kimbrel picked up his second save in two days. Rick Porcello pitched seven innings, holding the Phillies to two hits and one run, as the Red Sox won the opener of a two-game set, 2–1. Boston's runs came on solo homers by Sandy León and pinch hitter Brock Holt. The Phillies won the second game, 7–4, their three-run seventh inning being the difference. Mitch Moreland had three RBIs on a bases-loaded double. In the opening game of the series, Tampa Bay scored three times in the top of the first inning, but was held scoreless for the rest of the game, as Boston won, 7–3. Xander Bogaerts had two doubles and a triple, going 3-for-4 with two RBIs. In the second game of the series, the Red Sox jumped out to a 4–0 lead after the first inning, in what would be a 5–2 win. J. D. Martinez hit his 38th home run of the season, and David Price improved his record to 13–6. Tampa Bay kept Boston scoreless in the closing game of the series, 2–0, as the Red Sox were held to two hits. In their first series with the Indians during 2018, Boston lost the first game, 5–4, after building a 3–0 lead through two innings. The Indians had three home runs off of Red Sox starter Rick Porcello, who took the loss. In the second game of the series, Cleveland collected 13 hits en route to a 6–3 win, giving Boston their third consecutive loss for only the second time during the season, the first being in April. Starter Nathan Eovaldi took the loss. A five-run fourth inning helped Boston win the third game of the series, 10–4. Mitch Moreland had a home run, while Xander Bogaerts hit two. In the final game of the series, David Price pitched eight shutout innings, as the Red Sox won, 7–0. Boston sent 11 men to the plate in the fifth inning, scoring six times. Boston out-hit Tampa Bay, 13–12, in the first game of the series, but lost, 10–3. All of Boston's hits were singles, and the team had 11 men left on base. J. D. Martinez and Xander Bogaerts were each 3-for-5 at the plate. In the second game of the series, the Red Sox took a 1–0 lead in the second inning, but were then held scoreless as the Rays won, 5–1. In the closing game of the series, Boston was held to three hits, falling 9–1 to Tampa Bay, marking the first time the Red Sox were swept in a series during the season. Eduardo Núñez hit his ninth home run of the season against the Marlins on August 29. In the first game of the series, Boston took a 4–1 lead into the eighth inning, when Miami scored five runs off of the Red Sox bullpen. Trailing 6–4, Boston then scored three in the bottom of the eighth to retake the lead, 7–6. In the top of the ninth, the Marlins tied the game at seven, with a run off of closer Craig Kimbrel. The Red Sox then won the game in the bottom of the ninth when the Marlins were unable to turn a double play on an Eduardo Núñez ground ball, allowing J. D. Martinez to score on a throwing error. In the second and final game of the series, Boston trailed, 5–3, going to the bottom of the seventh, when they erupted for 11 runs on 12 hits. This marked the first time a major league team recorded hits on 12 consecutive at bats in a single inning. A walk and a sacrifice bunt occurred, but those are only considered plate appearances, not at bats. The sequence was: single, double, single, double, double, sacrifice bunt, triple, intentional walk, single, single, single, double, single, single, followed by a ground ball yielding a double play that ended the inning. The Red Sox sent 15 men to the plate, with five batters collecting two hits each. Tyler Thornburg recorded the win in relief, with the final score being 14–6. Both Eduardo Núñez and Mookie Betts hit home runs during the game. In the opener of a four-game series, Boston fell behind, 4–0, until scoring nine unanswered runs; four in the seventh inning and five in the ninth inning. Ian Kinsler went 3-for-4, while Mookie Betts and J. D. Martinez both homered. Ryan Brasier notched his first MLB win, one of four Boston relievers who each pitched a scoreless inning. The second game of the series included a two-hour rain delay, as Boston was outhit by Chicago, 14–5, and lost the game, 6–1. Boston's only run was a homer by Andrew Benintendi. Xander Bogaerts was ejected for the first time in his career, following an eighth-inning strikeout. Brandon Phillips had a two-run home run in his Red Sox debut on September 5. In the third game of a four-game series, Eduardo Rodríguez returned from the disabled list and got the win, striking out 12 in ​5 2⁄3 innings, as the Red Sox won, 6–1. Eduardo Núñez, Jackie Bradley Jr., and Ian Kinsler each hit home runs. Chicago won the final game of the series, 8–0, as Boston was held to five hits, and did not have a runner advance past second base. The Red Sox won the series' opening game, 8–2, after holding a 3–2 lead at the end of seven innings and then scoring five unanswered runs in the final two frames. The two teams combined to use 14 pitchers; Brandon Workman got the win in relief. Ian Kinsler went 2-for-5 with three RBIs. In the second game of the series, Atlanta established an early 1–0 lead, but was held scoreless after the second inning, as Boston won, 5–1. Steve Pearce was 3-for-4 with three RBIs, and starter Rick Porcello improved his season record to 16–7. Boston completed the sweep in a come-from-behind victory in the third game of the series. Down 7–1 after seven innings, the Red Sox rallied for six runs in the top of the eighth to tie the game. After the Braves scored once in the bottom of the eighth on a solo home run by Freddie Freeman, a two-run home run by Brandon Phillips in the top of the ninth gave the Red Sox a 9–8 lead. Craig Kimbrel closed out the win in the bottom of the ninth with his 38th save of the season. Phillips, who was making his Red Sox debut, was 1-for-3 with two walks, two RBIs, and three runs scored. The Astros won the first game of the series, 6–3, after being held scoreless through the first six innings. Starter David Price had 10 strikeouts in ​6 1⁄3 innings and was charged with two runs, although all of Houston's runs were scored with Red Sox relief pitchers on the mound. Xander Bogaerts hit his 20th home run of the season. The Astros won the second game, 5–3, after building a 5–1 lead through four innings. Eduardo Rodríguez took the loss, allowing five runs in ​3 1⁄3 innings, while Bogaerts again homered. Boston won the closing game of the series, 6–5, with Mitch Moreland hitting a walk-off RBI single in the bottom of the ninth to break a 5–5 tie. The Red Sox had built a 5–1 lead through five innings, only to see the Astros plate four runs in the sixth to tie the game. J. D. Martinez hit his 40th home run of the season, while Bogaerts was 4-for-4 with a walk and an RBI. Mookie Betts went 7-for-12 during the series, raising his average to .342 for the season. In the first game of the series, Toronto had a 2–0 lead through six innings, with Boston then scoring seven unanswered runs for a 7–2 final. Chris Sale returned from the disabled list, pitching the first inning as the Red Sox used seven pitchers in relief, with Ryan Brasier getting the win. Brock Holt hit a three-run pinch-hit home run, as the Red Sox became the first major league team to clinch a spot in the 2018 postseason. Boston won the second game of the series, 1–0, with the game's only run coming on a wild pitch in the fifth inning. Starter David Price went seven innings while striking out seven, walking none, and limiting the Blue Jays to three hits. With this win, the Red Sox reached 100 wins for the first time since their 1946 season. In the final game of the series, J. D. Martinez hit his 41st homer of the season to tie for the MLB lead. Toronto scored twice in the top of the eighth inning to tie the game, 3–3. Boston went ahead, 4–3, in the bottom of the inning, with Xander Bogaerts scoring from third on an infield error. Craig Kimbrel then retired the Blue Jays in order for his 40th save of the season. Steven Wright pitched three innings of scoreless relief on September 20, getting the win as the Red Sox clinched the AL East division title. The Red Sox were held scoreless in the first game of the series, losing 8–0 as Mets starter Noah Syndergaard allowed only three hits in seven innings. In the second game of the series, Boston overcame a 3–1 deficit, scoring four runs in the fifth inning on two-RBI doubles by Jackie Bradley Jr. and Brock Holt, for a 5–3 final. Steve Pearce was 3-for-4 at the plate, while Rick Porcello improved his record to 17–7 for the season. In the final game of the series, Boston scored three runs in the third inning, with two of those runs coming on a home run by Holt, en route to a 4–3 win. The Red Sox used a total of seven pitchers, with starter Chris Sale going three innings and getting a no decision. In the opening game of the three-game series, Red Sox starter Nathan Eovaldi held the Yankees scoreless through six innings. However, his gem was wasted as Neil Walker hit a three-run home run off of Ryan Brasier in the seventh inning, and the Yankees went on to win, 3–2. New York took the second game of the series, 10–1, with first baseman Luke Voit going 4-for-4 at the plate including three RBIs on two home runs. Boston won the closing game of the series, 11–6, with homers from Brock Holt, Jackie Bradley Jr., and Mookie Betts. The win gave the Red Sox the American League East division title, for the third consecutive season. Sam Travis and Tzu-Wei Lin hit their first major league home runs for Boston in a 7–5 victory in the opener, a game that saw Matt Barnes pick up his sixth win of the season after starter Chris Sale pitched ​3 1⁄3 innings, giving up two earned runs and striking out seven. Cleveland won the second game of the series, 5–4, in 11 innings. Drew Pomeranz took the loss in relief, with Rafael Devers and Blake Swihart hitting home runs for Boston. The third game of the series was again an 11-inning Cleveland win, 4–3. Mookie Betts went 4-for-6, including his 31st home run of the season; William Cuevas allowed only one run in ​5 1⁄3 innings of relief, but took the loss. Mookie Betts joined the 30–30 club with his 30th steal of the season, on September 26 against the Orioles. The Red Sox won their 106th game of the season, setting a new franchise record, with a 6–2 victory in the opening game of the series. Starting pitcher Nathan Eovaldi allowed one run in five innings and got the win, while Mookie Betts hit his 32nd home run of the season. The second game of the series, postponed a day due to rain, saw the Red Sox score early and often, en route to a 19–3 victory. Baltimore starting pitcher Ryan Meisinger lasted only one-third of an inning while giving up five runs. David Price got the win for Boston, while J. D. Martinez, Xander Bogaerts, and Blake Swihart each had home runs and Rafael Devers went 4-for-5 including two homers and six RBIs. Betts had his 30th stolen base of the season, making him the 40th player in MLB history with at least 30 homers and 30 steals in a season, joining the 30–30 club. The Orioles won the final game of the series, 10–3, scoring seven unanswered runs after the game was tied at three at the end of the fifth inning, just their 3rd win against the Red Sox all season. In the first game of the final regular season series, the Yankees defeated the Red Sox, 11–6, after jumping out to an 8–0 lead after four innings. Steve Pearce had five RBIs, including Boston's tenth grand slam of the year. New York's win gave them home field advantage for the 2018 American League Wild Card Game. New York also took the second game, 8–5, their 100th win of the season. Brock Holt homered for Boston. The Red Sox won the final game of the series and their regular season, 10–2. Xander Bogaerts and J. D. Martinez both homered, with Eduardo Rodríguez picking up the win as Boston used eight pitchers. Mookie Betts went 1-for-2 and finished the season with a .346 average, while Martinez finished with 43 home runs and 130 RBIs. Boston entered the Division Series as the top seed in the American League, facing New York, the AL Wild Card Game winner. This was the first ALDS meeting between the teams (playoff structure before 2012 precluded teams in the same division from meeting before the Championship Series). After splitting the first two games at Fenway Park, the Red Sox won the next two games at Yankee Stadium, eliminating New York and sending Boston on to the ALCS. The Red Sox' 16–1 defeat of the Yankees in Game 3, during a misty evening in The Bronx, included two historical footnotes. Firstly, the fifteen-run margin of victory for Boston accounted for the Yankees' worst-ever postseason defeat. The Red Sox failed to score in only the first, fifth, and sixth innings, and generated 7 of their 16 runs in the fourth inning, chasing starter Luis Severino and batting through the order. In addition, Brock Holt hit for the cycle, the first player ever to do so in an MLB postseason game, capping off his performance with a ninth-inning home run against catcher Austin Romine, brought in to pitch when the New York bullpen was overtaxed. Chris Sale got the win at Fenway in Game 1. Xander Bogaerts hit Boston's only home run in Game 2. Brock Holt hit the first postseason cycle in MLB history in Game 3. Boston starter Rick Porcello got the win in Game 4, sending the Red Sox to the ALCS. Boston faced Houston in the Championship Series, a matchup of 100-win teams, and a rematch of the 2017 ALDS, which was won by Houston. After losing Game 1 at Fenway, the Red Sox won the next four games, including three played in Houston, to eliminate the Astros and advance to the World Series. Game 1 starter Chris Sale had a stomach issue during the week, which included brief hospital stay, and manager Alex Cora decided not to have him start Game 5. David Price started in his place and held Houston scoreless through six innings while allowing just three hits and striking out nine. It was Price's first win in 12 career postseason starts. Jackie Bradley Jr., who had nine RBIs in the series on three hits (a double and two home runs), was named ALCS MVP. Mitch Moreland had a bases loaded walk in Game 1 for Boston's first RBI of the ALCS. A three-RBI double by Jackie Bradley Jr. gave the Red Sox a 5–4 lead in Game 2. Steve Pearce, seen here with the Orioles in 2012, hit a go-ahead home run in the 6th inning of Game 3. Andrew Benintendi had two doubles, scored twice, and made a game-ending diving catch in Game 4. Boston starter David Price struck out nine and got the Game 5 win, as Boston advanced to the World Series. Eduardo Núñez hit a three-run homer in the 7th inning of Game 1. Nathan Eovaldi pitched six innings of relief in Game 3, holding the Dodgers to three hits, but ultimately taking the loss in the 18th inning. Mookie Betts hit the first postseason home run of his career in Game 5. The Red Sox and Dodgers franchises met in the World Series for the second time; the first was a Boston win in 1916. Game 1 was highlighted by neither Chris Sale nor Clayton Kershaw making it through the fifth inning, and a pinch hit three-run home run by Eduardo Núñez, as Boston won, 8–4. Game 2 starter David Price held the Dodgers to two runs on three hits in six innings, while striking out five, picking up his second win of the postseason, as the Red Sox won, 4–2. Game 3 became the longest game in World Series history, both in innings (18) and by time (7 hours and 20 minutes). Nathan Eovaldi pitched six innings in relief, allowing only two hits prior to a walk-off home run by Max Muncy for a 3–2 Dodgers win. Eduardo Rodríguez started Game 4, holding the Dodgers scoreless through five innings, but then yielding four runs in the sixth. The Red Sox stormed back with help from Mitch Moreland and Steve Pearce, scoring nine runs in the final three innings, winning the game, 9–6, for a 3–1 series lead. Game 5 started with three first-inning runs, with Boston holding a 2–1 edge. There was no further scoring until the Red Sox scored one run in each of the sixth, seventh, and eighth innings. Price, pitching on short rest, held the Dodgers to one run on three hits in seven innings. The game ended in a 5–1 final for Boston, the franchise's fourth World Series championship in 15 years. Price got the win, his second of the World Series and third of the postseason. Pearce had three RBIs on two home runs in the game, giving him a total of three home runs and eight RBIs in the series—he was named World Series MVP. The team's motto during the season, "do damage", became "damage done" upon their victory. April 23: Pitcher Roenis Elías was traded to the Seattle Mariners for cash or a PTBNL; the Red Sox later received minor league OF/1B Eric Filia; however, he failed his physical and was returned to the Mariners, with cash considerations completing the trade. May 25: First baseman Hanley Ramírez was designated for assignment. June 28: OF/1B Steve Pearce was acquired from the Toronto Blue Jays for minor league infielder Santiago Espinal. July 25: Pitcher Jalen Beeks was traded to the Tampa Bay Rays for pitcher Nathan Eovaldi. July 30: Second baseman Ian Kinsler was acquired from the Los Angeles Angels for Triple-A pitchers Ty Buttrey and Williams Jerez. Boston's first 15 selections in the 2018 MLB draft, held on June 4–6, are listed below. All of the Red Sox' picks, through the 40 rounds of the draft, are listed on the MLB.com site here. Elih Marrero is the son of former MLB player Eli Marrero. Nicholas Lucky did not sign; he will attend Coastal Carolina. — April 16 Orioles Postponed (rain). Makeup date May 17. — July 25 @ Orioles Postponed (rain). Makeup date August 11. — September 25 Orioles Postponed (rain). Makeup date September 26. Jackie Bradley Jr. had a grand slam in ALCS Game 3. Mookie Betts' cycle was the first in MLB during the 2018 season. Holt's cycle was the first in MLB postseason history. The team held an alumni game on May 27, before a home game against the Atlanta Braves; it was the Red Sox' first such game since 1993. Dwight Evans and Luis Tiant acted as managers, assisted by bench coaches Joe Morgan and Jim Rice, respectively. The four-inning exhibition was won by Tiant's team, as Julio Lugo hit a two-run homer off of Pedro Martínez for the only runs in the game. Other Red Sox alumni participating included Wade Boggs, Oil Can Boyd, Mike Greenwell, Bill Lee, Derek Lowe, Mike Lowell, and Troy O'Leary. Top ten batters shown. Qualified batters in bold. Top ten pitchers shown. Qualified pitchers in bold. Alex Cora finished second to Bob Melvin of the Oakland Athletics for the AL Manager of the Year Award. ^ Browne, Ian (October 11, 2017). "Red Sox release manager John Farrell after five seasons". MLB.com. Retrieved October 27, 2017. ^ Browne, Ian (October 22, 2017). "Sox finalize 3-year deal with Cora to manage". MLB.com. Retrieved October 27, 2017. ^ Yang, Nicole (October 25, 2017). "Fenway Park may offer fans their own dugout seats". The Boston Globe. Retrieved March 30, 2018. ^ "JIM BEAM DUGOUT". MLB.com. Retrieved March 30, 2018. ^ Mastrodonato, Jason (October 26, 2017). "Red Sox coaches Carl Willis, Chili Davis, Brian Butterfield move on". bostonherald.com. Retrieved October 27, 2017. ^ Thomas, Kevin (November 2, 2017). "Red Sox promote Sea Dogs manager to become third-base coach". Portland Press Herald. Portland, Maine. Retrieved March 30, 2018. ^ Mastrodonato, Jason (November 2, 2017). "Red Sox hire ex-Brewers manager Ron Roenicke as bench coach". Boston Herald. Retrieved March 30, 2018. ^ Browne, Ian (November 4, 2017). "Red Sox choose Tim Hyers as hitting coach". MLB.com. Retrieved March 30, 2018. ^ Browne, Ian (November 8, 2017). "Red Sox announce trio of coaching hires". MLB.com. Retrieved March 30, 2018. ^ Browne, Ian (November 13, 2017). "Red Sox hire Bjornson to be bullpen coach". MLB.com. Retrieved March 30, 2018. ^ Browne, Ian (December 18, 2017). "Rod Sox re-sign Moreland, J.D. Still In Play". MLB.com. Retrieved February 19, 2018. ^ Joseph, Andrew (January 22, 2018). "The Red Sox are dramatically expanding netting at Fenway after scary incidents". USA Today. Retrieved March 30, 2018. ^ a b c d e "Red Sox Announce Report Dates For 2018 Spring Training". WBZ-TV. November 20, 2017. Retrieved May 30, 2018. ^ Todd, Jeff (February 18, 2018). "Red Sox Re-Sign Eduardo Nunez". MLB Trade Rumors. Retrieved February 20, 2018. ^ a b "Boston Red Sox Schedule". MLB.com. February 2018. Retrieved May 30, 2018. ^ Cole, Mike (February 26, 2018). "It's (Finally) Official: Red Sox Announce J.D. Martinez's Five-Year Contract". NESN.com. Retrieved February 26, 2018. ^ Yang, Nicole (February 28, 2018). "Red Sox file petition to officially change name of Yawkey Way". boston.com. Retrieved February 28, 2018. ^ "Yawkey Way signs come down outside Fenway Park". Boston.com. AP. May 3, 2018. Retrieved May 3, 2018. ^ Randall, Dakota (March 24, 2018). "Red Sox Trade Deven Marrero To D-Backs For Player To Be Named Later Or Cash". NESN.com. Retrieved March 27, 2018. ^ "Boston Red Sox Schedule". MLB.com. March 2018. Retrieved May 30, 2018. ^ "Red Sox name Chris Sale Opening Day starter". MLB.com. Retrieved 2018-03-28. ^ "Chris Sale Chris Archer to duel on Opening Day". MLB.com. Retrieved 2018-03-28. ^ "Red Sox vs. Rays - Box Score - March 29, 2018". ESPN. March 29, 2018. Retrieved March 29, 2018. ^ "Benches repeatedly clear at Fenway Park after hard slide from Yankees' Tyler Austin". The Comeback. 2018-04-11. Retrieved 2018-04-24. ^ "Benches clear twice, 4 ejected as Yankees top Red Sox 10-7". MLB. Retrieved April 12, 2018. ^ "Red Sox vs. Athletics - Box Score". ESPN. April 21, 2018. Retrieved April 21, 2018. ^ Mearns, Andrew (April 22, 2018). "The Red Sox were red-hot, but it didn't stop Sean Manaea from twirling a no-hitter". MLB.com Cut4. ^ "A's lefty Sean Manaea pitches first no-hitter vs. Red Sox in 25 years". ESPN. April 22, 2018. Retrieved April 22, 2018. ^ Browne, Ian (April 30, 2018). "In 21st win, Sox's 6th slam ties '96 Expos mark". MLB.com. Retrieved April 30, 2018. ^ Powtak, Ken (April 30, 2018). "What a month: Red Sox complete best April with win over Kansas City". Boston.com. AP. Retrieved May 1, 2018. ^ Powtak, Ken (May 2, 2018). "Mookie Betts homers 3 times as Red Sox beat Royals 5-4". Boston.com. AP. Retrieved May 2, 2018. ^ "Maile hits game-winning HR in 12th, Jays beat Red Sox 5-3". ESPN. AP. May 11, 2018. Retrieved May 11, 2018. ^ "Red Sox pitcher David Price dealing with carpal tunnel syndrome". ESPN. May 10, 2018. Retrieved May 12, 2018. ^ London, Adam (June 4, 2018). "Red Sox's Alex Cora Explains Why Steven Wright Will Make Spot Start Tuesday". NESN. Retrieved June 5, 2018. ^ Browne, Ian (June 22, 2018). "J.D. ties MLB HR lead (23), lifts Sox with 5 RBIs". MLB.com. Retrieved June 22, 2018. ^ Theisen, Lauren (June 27, 2018). "Angels Rookie Pitcher Jake Jewell Carried Off On Stretcher After Awful Ankle Injury". Deadspin. Retrieved June 27, 2018. ^ Caron, Tom [@TomCaron] (June 28, 2018). "Hard to believe Sox have never swept the Angels in a season series. They've also never gone 6-0 against a team in the regular season. Longest season series they've swept is 4 games. #RedSox" (Tweet). Retrieved June 29, 2018 – via Twitter. ^ Theisen, Lauren (July 12, 2018). "Mookie Betts's 13-Pitch Grand Slam At-Bat Is Best Viewed In Its Entirety". Deadspin. Retrieved July 13, 2018. ^ "Mookie Betts, rolling Red Sox try for 11th straight win Friday". Boston.com. AP. July 13, 2018. Retrieved July 13, 2018. ^ "American League vs. National League". ESPN. July 17, 2018. Retrieved July 17, 2018. ^ "Porcello throws 6 shutout innings as Red Sox top Orioles 5-3". ESPN. AP. July 23, 2018. Retrieved July 23, 2018. ^ Ginsburg, David (July 25, 2018). "Rain washes out Red Sox-O's game; 3 Red Sox homers wiped off the board". Boston.com. AP. Retrieved July 25, 2018. ^ "Yankees vs. Red Sox - Game Recap". ESPN. AP. August 2, 2018. Retrieved August 3, 2018. ^ Smith, Christopher (August 3, 2018). "Mookie Betts playing second base for Boston Red Sox as Ian Kinsler exits game with left hamstring tightness". masslive.com. Retrieved August 4, 2018. ^ "Mookie monster! Betts homers in 9th to complete cycle". ESPN. AP. August 9, 2018. Retrieved August 9, 2018. ^ Penney, Sean (August 30, 2018). "Red Sox Review: Breaking down the epic 11-run inning vs Marlins". bosoxinjection.com. Retrieved August 30, 2018. ^ @SoxNotes (August 30, 2018). "In the 7th inning last night, the Red Sox became the 1st team in MLB history to record a hit in 12 consecutive at-bats in an inning" (Tweet). Retrieved August 30, 2018 – via Twitter. ^ "Red Sox vs. White Sox - Game Recap". ESPN. August 31, 2018. Retrieved September 1, 2018. ^ "Red Sox clinch playoff spot as Chris Sale returns to pitch one scoreless inning". ESPN. September 11, 2018. Retrieved September 11, 2018. ^ Silverman, Michael (September 12, 2018). "David Price, Red Sox blank Blue Jays for 100th victory". Boston Herald. Retrieved September 12, 2018. ^ Browne, Ian (September 14, 2018). "Bogaerts catalyzes sweep with Magic No. at 6". MLB.com. Retrieved September 14, 2018. ^ MacPherson, Brian (September 24, 2018). "Sox win record 106th, clinch Majors' best mark". MLB.com. Retrieved September 24, 2018. ^ Forde, Craig (September 26, 2018). "Sox reach several milestones in G1 rout of O's". MLB.com. Retrieved September 26, 2018. ^ Hoch, Bryan (September 28, 2018). "Yankees win, will host AL Wild Card Game". MLB.com. Retrieved September 28, 2018. ^ Yankees Endure Franchise's Worst Postseason Loss Ever as Red Sox Win 16-1 in Game 3. SI.com. Retrieved October 9, 2018. ^ Polacek, Scott. Brock Holt hits first ever postseason cycle in Red Sox blowout win va. Yankees. Bleacher Report. Retrieved October 9, 2018. ^ a b Stephen, Eric (October 19, 2018). "Jackie Bradley Jr. named ALCS MVP". SB Nation. Retrieved October 19, 2018. ^ "Red Sox Roster & Staff – Transactions". MLB.com. April 2018. Retrieved May 25, 2018. ^ "Red Sox receive minor leaguer to complete trade with Mariners". The Boston Globe. June 13, 2018. Retrieved June 13, 2018 – via Boston.com. ^ Smith, Christopher (June 15, 2018). "Boston Red Sox return Eric Filia to Seattle Mariners after he didn't pass his physical". masslive.com. Retrieved June 16, 2018. ^ Speier, Alex (May 25, 2018). "Red Sox to part ways with Hanley Ramirez". The Boston Globe. Retrieved May 25, 2018. ^ "Red Sox acquire OF Pearce from Blue Jays". MLB.com. June 28, 2018. Retrieved June 28, 2018. ^ Mahoney, Andrew (July 25, 2018). "Red Sox acquire Nathan Eovaldi from Rays". Boston.com. Retrieved July 25, 2018. ^ Browne, Ian (July 31, 2018). "With Pedroia's return uncertain, Sox get Kinsler". MLB.com. Retrieved July 31, 2018. ^ "2018 Draft Tracker - Boston Red Sox". MLB.com. Retrieved June 5, 2018. ^ "Baseball Roster – Elih Marrero". hailstate.com. 2016. ^ Pugliese, Diana (July 6, 2018). "L-L baseball coaches name 'Sweet 16' All-League team, led by 3 from league champion Ephrata". lancasteronline.com. Retrieved July 13, 2018. ^ "Boston Red Sox 2018 Schedule – Red Sox Home and Away - ESPN". ESPN. Retrieved October 23, 2017. ^ Dunphy, Mark (May 17, 2018). "The Red Sox announced their first alumni game at Fenway Park in 25 years". Boston.com. Retrieved May 17, 2018. ^ a b Powtak, Ken (May 27, 2018). "Julio Lugo on his homer off Pedro Martinez: 'It was awesome'". Boston.com. AP. Retrieved May 27, 2018. ^ Silverman, Michael (May 27, 2018). "Red Sox alumni game worth the wait". Boston Herald. Retrieved May 27, 2018. 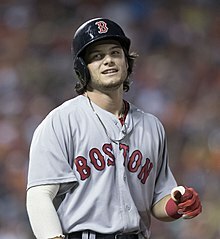 ^ "Andrew Benintendi Stats, Fantasy & News". MLB.com. Retrieved October 29, 2018. ^ "Mookie Betts Stats, Fantasy & News". MLB.com. Retrieved October 29, 2018. ^ "Xander Bogaerts Stats, Fantasy & News". MLB.com. Retrieved October 29, 2018. ^ "Jackie Bradley Jr. Stats, Fantasy & News". MLB.com. Retrieved October 29, 2018. ^ "Rafael Devers Stats, Fantasy & News". MLB.com. Retrieved October 29, 2018. ^ "Nathan Eovaldi Stats, Fantasy & News". MLB.com. Retrieved October 29, 2018. ^ "Brock Holt Stats, Fantasy & News". MLB.com. Retrieved October 29, 2018. ^ "Ian Kinsler Stats, Fantasy & News". MLB.com. Retrieved October 29, 2018. ^ "Sandy León Stats, Fantasy & News". MLB.com. Retrieved October 29, 2018. ^ "J. D. Martinez Stats, Fantasy & News". MLB.com. Retrieved October 29, 2018. ^ "Mitch Moreland Stats, Fantasy & News". MLB.com. Retrieved October 29, 2018. ^ "Eduardo Núñez Stats, Fantasy & News". MLB.com. Retrieved October 29, 2018. ^ "Steve Pearce Stats, Fantasy & News". MLB.com. Retrieved October 29, 2018. ^ "Rick Porcello Stats, Fantasy & News". MLB.com. Retrieved October 29, 2018. ^ "David Price Stats, Fantasy & News". MLB.com. Retrieved October 29, 2018. ^ "Eduardo Rodríguez Stats, Fantasy & News". MLB.com. Retrieved October 29, 2018. ^ "Blake Swihart Stats, Fantasy & News". MLB.com. Retrieved October 29, 2018. ^ "Christian Vázquez Stats, Fantasy & News". MLB.com. Retrieved October 29, 2018. ^ "Matt Barnes Stats, Fantasy & News". MLB.com. Retrieved October 29, 2018. ^ "Ryan Brasier Stats, Fantasy & News". MLB.com. Retrieved October 29, 2018. ^ "Heath Hembree Stats, Fantasy & News". MLB.com. Retrieved October 29, 2018. ^ "Joe Kelly Stats, Fantasy & News". MLB.com. Retrieved October 29, 2018. ^ "Craig Kimbrel Stats, Fantasy & News". MLB.com. Retrieved October 29, 2018. ^ "Eduardo Rodriguez Stats, Fantasy & News". MLB.com. Retrieved October 29, 2018. ^ "Chris Sale Stats, Fantasy & News". MLB.com. Retrieved October 29, 2018. ^ "Brandon Workman Stats, Fantasy & News". MLB.com. Retrieved October 29, 2018. ^ "Andrew Benintendi Stats, Fantasy & News". MLB.com. Retrieved October 2, 2018. ^ "Mookie Betts Stats, Fantasy & News". MLB.com. Retrieved October 2, 2018. ^ "Xander Bogaerts Stats, Fantasy & News". MLB.com. Retrieved October 2, 2018. ^ "Jackie Bradley Jr. Stats, Fantasy & News". MLB.com. Retrieved October 2, 2018. ^ "Rafael Devers Stats, Fantasy & News". MLB.com. Retrieved October 2, 2018. ^ "Brock Holt Stats, Fantasy & News". MLB.com. Retrieved October 2, 2018. ^ "J. D. Martinez Stats, Fantasy & News". MLB.com. Retrieved October 2, 2018. ^ "Mitch Moreland Stats, Fantasy & News". MLB.com. Retrieved October 2, 2018. ^ "Steve Pearce Stats, Fantasy & News". MLB.com. Retrieved October 2, 2018. ^ "Rick Porcello Stats, Fantasy & News". MLB.com. Retrieved October 2, 2018. ^ "Dan Butler Stats, Fantasy & News". MLB.com. Retrieved October 2, 2018. ^ "Nathan Eovaldi Stats, Fantasy & News". MLB.com. Retrieved October 2, 2018. ^ "Heath Hembree Stats, Fantasy & News". MLB.com. Retrieved October 2, 2018. ^ "Brian Johnson Stats, Fantasy & News". MLB.com. Retrieved October 2, 2018. ^ "Ian Kinsler Stats, Fantasy & News". MLB.com. Retrieved October 2, 2018. ^ "Sandy León Stats, Fantasy & News". MLB.com. Retrieved October 2, 2018. ^ "Tzu-Wei Lin Stats, Fantasy & News". MLB.com. Retrieved October 2, 2018. ^ "Eduardo Núñez Stats, Fantasy & News". MLB.com. Retrieved October 2, 2018. ^ "Dustin Pedroia Stats, Fantasy & News". MLB.com. Retrieved October 2, 2018. ^ "Brandon Phillips Stats, Fantasy & News". MLB.com. Retrieved October 2, 2018. ^ "Hanley Ramírez Stats, Fantasy & News". MLB.com. Retrieved October 2, 2018. ^ "Tony Renda Stats, Fantasy & News". MLB.com. Retrieved October 2, 2018. ^ "Eduardo Rodríguez Stats, Fantasy & News". MLB.com. Retrieved October 2, 2018. ^ "Chris Sale Stats, Fantasy & News". MLB.com. Retrieved October 2, 2018. ^ "Blake Swihart Stats, Fantasy & News". MLB.com. Retrieved October 2, 2018. ^ "Sam Travis Stats, Fantasy & News". MLB.com. Retrieved October 2, 2018. ^ "Christian Vázquez Stats, Fantasy & News". MLB.com. Retrieved October 2, 2018. ^ "Héctor Velázquez Stats, Fantasy & News". MLB.com. Retrieved October 2, 2018. ^ "Boston Red Sox Leaderboards » 2018 » Batters » Dashboard". FanGraphs Baseball. Retrieved October 2, 2018. ^ "Matt Barnes Stats, Fantasy & News". MLB.com. Retrieved October 1, 2018. ^ "Ryan Brasier Stats, Fantasy & News". MLB.com. Retrieved October 1, 2018. ^ "Nathan Eovaldi Stats, Fantasy & News". MLB.com. Retrieved October 1, 2018. ^ "Joe Kelly Stats, Fantasy & News". MLB.com. Retrieved October 1, 2018. ^ "Craig Kimbrel Stats, Fantasy & News". MLB.com. Retrieved October 1, 2018. ^ "Rick Porcello Stats, Fantasy & News". MLB.com. Retrieved October 1, 2018. ^ "David Price Stats, Fantasy & News". MLB.com. Retrieved October 1, 2018. ^ "Eduardo Rodriguez Stats, Fantasy & News". MLB.com. Retrieved October 1, 2018. ^ "Chris Sale Stats, Fantasy & News". MLB.com. Retrieved October 1, 2018. ^ "Héctor Velazquez Stats, Fantasy & News". MLB.com. Retrieved October 1, 2018. ^ "Jalen Beeks Stats, Fantasy & News". MLB.com. Retrieved October 1, 2018. ^ "William Cuevas Stats, Fantasy & News". MLB.com. Retrieved October 1, 2018. ^ "Justin Haley Stats, Fantasy & News". MLB.com. Retrieved October 1, 2018. ^ "Heath Hembree Stats, Fantasy & News". MLB.com. Retrieved October 1, 2018. ^ "Brian Johnson Stats, Fantasy & News". MLB.com. Retrieved October 1, 2018. ^ "Drew Pomeranz Stats, Fantasy & News". MLB.com. Retrieved October 1, 2018. ^ "Bobby Poyner Stats, Fantasy & News". MLB.com. Retrieved October 1, 2018. ^ "Robby Scott Stats, Fantasy & News". MLB.com. Retrieved October 1, 2018. ^ "Carson Smith Stats, Fantasy & News". MLB.com. Retrieved October 1, 2018. ^ "Tyler Thornburg Stats, Fantasy & News". MLB.com. Retrieved October 1, 2018. ^ "Marcus Walden Stats, Fantasy & News". MLB.com. Retrieved October 1, 2018. ^ "Brandon Workman Stats, Fantasy & News". MLB.com. Retrieved October 1, 2018. ^ "Steven Wright Stats, Fantasy & News". MLB.com. Retrieved October 1, 2018. ^ "Boston Red Sox Leaderboards » 2018 » Pitchers » Dashboard". FanGraphs Baseball. Retrieved October 2, 2018. ^ Hartwell, Darren (May 21, 2018). "J. D. Martinez named AL Player of the Week amid scorching stretch for Red Sox". New England Sports Network. Retrieved May 21, 2018. ^ Hartwell, Darren (July 2, 2018). "Chris Sale Wins AL Pitcher Of The Month After Torrid June For Red Sox". NESN. Retrieved July 14, 2018. ^ "Bogaerts, Reynolds earn weekly player awards". Major League Baseball. Retrieved July 9, 2018. ^ London, Adam (August 2, 2018). "Chris Sale Makes Red Sox History With Second Straight AL Pitcher Of The Month Award". NESN. Retrieved August 8, 2018. ^ "J.D. Martinez is named the AL Player of the Week". MLB.com. August 13, 2018. Retrieved August 13, 2018 – via YouTube. ^ Adler, David (September 4, 2018). "Turner, J.D. garner Player of Month honors". MLB.com. Retrieved September 4, 2018. ^ Cotillo, Chris (September 26, 2018). "Mookie Betts in 30-30 club: Joins Jacoby Ellsbury as only Boston Red Sox to reach milestone". masslive.com. Retrieved October 2, 2018. ^ Browne, Ian (September 30, 2018). "Betts claims first AL batting title with .346 AVG". MLB.com. Retrieved October 2, 2018. ^ "Red Sox claim more titles, beating Yankees 10-2 in finale". usatoday.com. Associated Press. September 30, 2018. Retrieved October 11, 2018. ^ Castrovince, Anthony (October 26, 2018). "J.D., Yelich named 2018 Aaron Award winners". MLB.com. Retrieved October 26, 2018. ^ "Pearce named World Series MVP". MLB.com. October 28, 2018. Retrieved October 28, 2018. ^ "Jacob deGrom and David Price honored by NY baseball writers". New York Post. AP. November 3, 2018. Retrieved November 15, 2018. ^ Randhawa, Manny (November 4, 2018). "Red Sox, Braves highlight Gold Glove winners". MLB.com. Retrieved November 4, 2018. ^ Thornburg, Chad (November 7, 2018). "Winners of Wilson defensive honors unveiled". MLB.com. Retrieved November 8, 2018. ^ @sluggernation (November 8, 2018). "After leading @MLB in batting average, @RedSox OF @mookiebetts takes home his second career #SilverSlugger" (Tweet). Retrieved November 8, 2018 – via Twitter. ^ @sluggernation (November 8, 2018). "In his first year with the @RedSox, @JDMartinez14 brings home his second career #SilverSlugger" (Tweet). Retrieved November 8, 2018 – via Twitter. ^ @sluggernation (November 8, 2018). "We've got #SilverSlugger history in 2018! After taking home a 2018 award for AL OF, @RedSox slugger @JDMartinez14 also wins the award for AL DH" (Tweet). Retrieved November 8, 2018 – via Twitter. ^ Justice, Richard (November 15, 2018). "Betts, Yelich win first career MVP Awards". MLB.com. Retrieved November 15, 2018. ^ "David Price, Jonny Venters earn Comeback Player awards". Boston.com. AP. November 20, 2018. Retrieved November 20, 2018. ^ Remillard, Calli (November 27, 2018). "Dave Dombrowski was named Executive of the Year". Boston.com. Retrieved November 27, 2018. ^ "Red Sox J.D. Martinez and Mookie Betts win Players Choice Awards". The Boston Globe. AP. November 28, 2018. Retrieved November 30, 2018. ^ "Bob Melvin joins select company by winning Manager of the Year for the 3rd time". BBWAA. November 13, 2018. Retrieved November 13, 2018. Bird, Hayden (October 31, 2018). "A moment-by-moment recap of the Red Sox victory parade". Boston.com. Retrieved October 31, 2018. Browne, Ian (August 9, 2018). "See the Red Sox Players' Weekend nicknames". MLB.com. Retrieved August 13, 2018. Finn, Chad (September 25, 2018). "Let's pause and appreciate what we've seen from these magical Red Sox". Boston.com. Retrieved September 26, 2018. Finn, Chad (October 29, 2018). "Where does this Red Sox championship rank among the four this century?". Boston.com. Retrieved October 29, 2018. McArdle, Tommy (April 9, 2019). "Here are the Red Sox' 2018 World Series rings". Boston.com. Retrieved April 9, 2019. Schoenfield, David (August 3, 2018). "This just might be the best Red Sox team ... ever". ESPN. Retrieved August 5, 2018.